A limited edition set stand-alone Settlers of Catan Game. Explore the founding of Nuremberg and its development into a city of renown, as you compete to raise the walls of the city. This is a complete stand alone game, with fixed board, cards, wood, and event timeline. Due to license restrictions this product will not be produced in English. 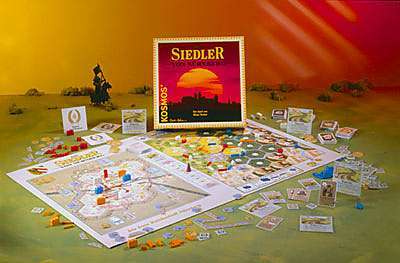 This game is stand-alone and is not played with any of the other Settlers family of games.